Love that you did a scrapbook page and incorporated stamping into it. You don't see that often as so many are fearful of stamping on pages, but yours was perfect...and those puppy eyes are to die for...I have an Aussie and they have sweet eyes too (and they know it). Love your creations!! This is ADORABLE, Alex!! Love that showcased these stamps with a Scrapbook page!! This is the SWEETEST page!!! The stamps you chose are perfect for that darling image of you sweet puppy!! OMG...LOVE the look on his face!!!!!!! What an adorable page, Alex! Love it! Oh Alex, I just LOVE LOVE LOVE this layout!!! 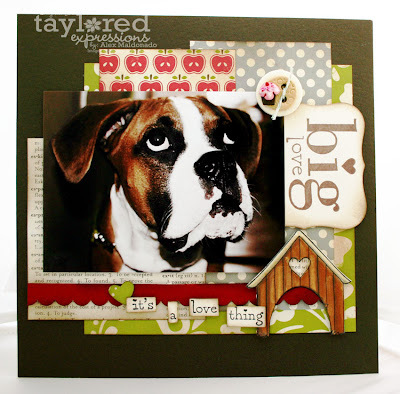 You did SOOOO awesome incorporating stamps into your project and the pic of your dog is just TOO SWEET! OK, so Tyson is just adorable!! !...and he will calm down...maybe when he's about 3 yrs old! The larger breeds seem to mature slower but that's what makes them who they are. Your S/B layout is perfect and quite the tribute to your new little man! I love your scrappy page, Alex! your pup is too cute!